With a great script, excellent cast and a fresh take on an old idea, Barry aims for the target and shoots a bullseye each week (yes the cheesy pun is intended). HBO has a long history of creating quality television with fantastic drama series and humorous comedies alike. This year they continued that tradition with Barry, the Bill Harder (Trainwreck) half hour sitcom. He writes produces, directs and stars in this critically acclaimed show that just won three Primetime Emmy Awards. Whether or not you have HBO you should see this show as it heads to stores on DVD and Digital Download. Barry Berkman (Hader) is a former United States Marine who ends up working as a hitman for hire thanks to his father's friend, Fuches (Stephen Root; Office Space). Fuches, who is somewhat of a father figure to Barry, get him assignments and in an odd way acts as a manager of sorts. Barry never seems to have an issue with the killings – former Marine and all - but lately, he has become lonely and dissatisfied with his life. The killings no longer hold the thrill and release he once felt and he starts questioning his career path. When Fuches brings Barry one more hit he flies to Los Angeles only to find out the target is a fitness instructor sleeping with the wife of a member of the Russian mob. As Barry tails the guy he follows him to an acting class where Barry gets suckered into a scene with a fellow member of the class. Suddenly Barry finds a new lease on life and decides he wants to quit the murder game and become an actor. It also doesn't hurt that he finds himself attracted to another actor in the class, Sally (Sarah Goldberg; The Dark Knight). As time moves on Barry must find a way to balance his newfound passions (acting and Sally) with the job he can't seem to quit no matter how hard he tries. Hader is brilliant as the writer, director, and the star of this show. His unique sensibilities give Barry a melancholy feel while highlighting the ridiculousness of his life. Hader's off-kilter approach to both the show and the characters (especially his own) open the series up for the absurd situations that seem to play out every week. The supporting cast, especially Henry Winkler as acting coach Gene Cousineau, is phenomenal and compliments Hader at every turn. Winkler is almost a caricature of what an acting coach should be and ironically, Gene also becomes a father figure in Barry's life (just like Fuches) as he studies his new trade. The first season consists of eight episodes and each one becomes more complicated and funnier than the last. The situations Barry finds himself in regularly are almost implausible and ridiculous and make the audience laugh at the lunacy of it all. The offbeat humor is subtle which makes the episodes even more laughable and as the season goes on the audience can't help to shake their heads at it all. The Barry the Complete First Season DVD combo pack consists of a single DVD disc and the digital download code. There are also two extras to enjoy – inside the episodes and the world of Barry. Both are interesting and worth watching. With a great script, excellent cast and a fresh take on an old idea, Barry aims for the target and shoots a bullseye each week (yes the cheesy pun is intended). Harder and Winkler both earn their well deserved Emmy Awards and their performances should not be missed. 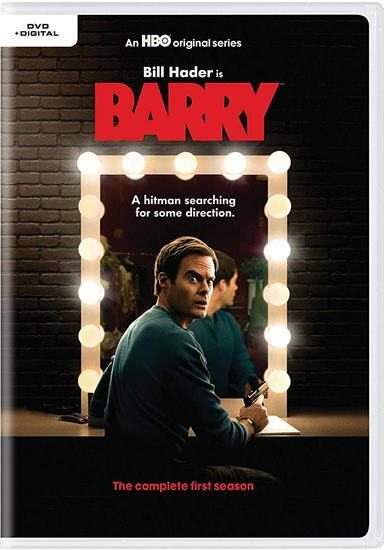 Download Barry: The Complete First Season from the iTunes Store in Digial HD. For more information about Barry visit the FlickDirect Movie Database.